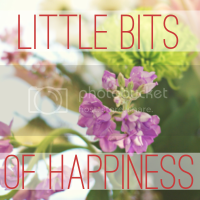 I'm linking up with Stephanie this week for Little Bits of Happiness. I respect that everyone is entitled to their own opinion and you do not have to agree with mine, but I just want to say "here here!" and "snap snap to that!" John Green. Plus... I kind of love him. It's hard to argue with a sing-a-ma-jig. Happy Thursday people! Hug someone you love today, that is totally legal as far as I know. I kind of totally love him.